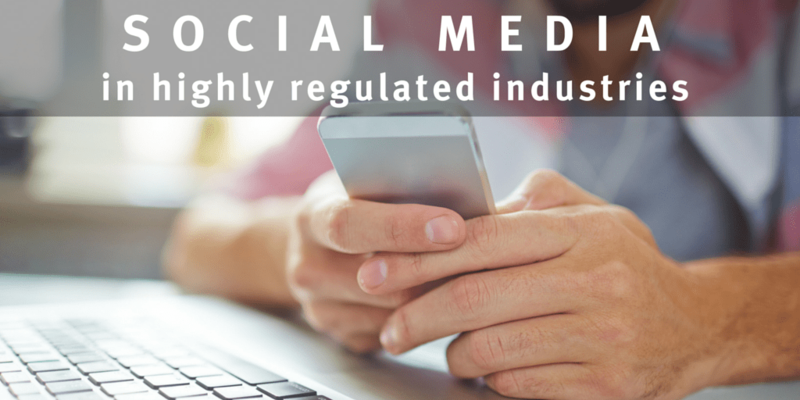 For many business in highly regulated environments (such as pharma, medtech, health care and financial sectors), social media may seem like a tool that is either irrelevant or too difficult to manage within stringent and often-changing regulatory parameters. Yet, the truth is, social media is just as applicable to these sectors as other B2B markets, and can be equally as effective. Being compliant and being quiet are not irreversibly fused. Yes, some of you out there may still think that social media is only for fun and games. Nothing serious is ever accomplished there, and even when serious topics (like politics) are discussed, it’s nothing but avarice and opinions. Right? Well, wrong. Social media is a very effective tool for many B2B companies not only for promoting their content (more on this here) but also for keeping tabs on the pulse of their markets — what’s known as social listening. In fact, according to a 2016 report from Content Marketing Institute, 93% of B2B marketing organizations use social media. 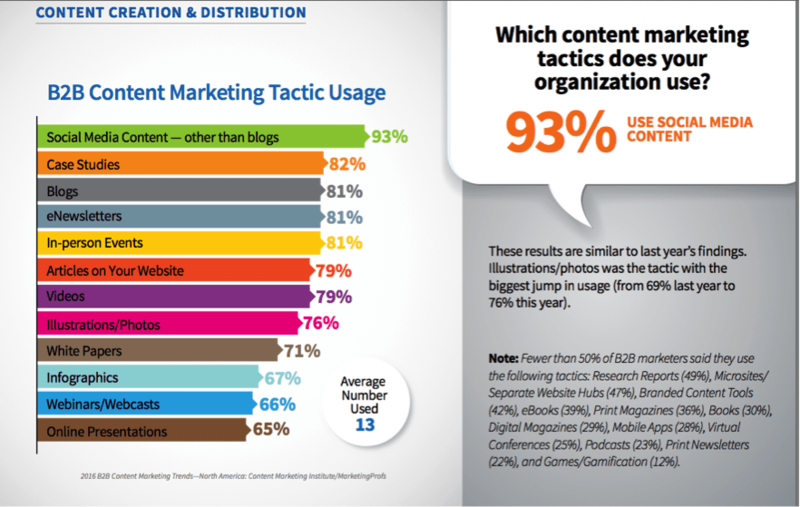 However, according to the same report, only 35% have documented their social media strategy. This could be a major downfall to success (read on for tips below). If you’re not monitoring or participating in the conversation, how can you possibly know what your customers, colleagues, partners and prospects are thinking? This brings me to two important aspects of social media in the B2B world, including regulated industries like healthcare, diagnostics and medical devices. You must focus on both monitoring and engagement. That translates into LISTENING and SHARING. Engagement (sharing) in social media means contributing to the conversation with new content, thoughts, ideas, reports, images, infographics and other content that your followers and audiences might find useful. It’s not (just) about self-promotion, but also about sharing ideas and contributing to a conversation. Your contributions can be entirely original (such as predictions, posts or reports that you or your company have produced), insights or perspectives on work from others (like adding your comments on news about a new law or protocol) or sharing things you found useful (such as a “How to” article or seminar presentation from the last conference you attended). Apply a simple rule: if your content passes medical, legal and regulatory review processes, it’s a candidate to build an engagement strategy. 1. Create a set of guidelines. The most important first step is to create a document outlining the issues that can and can’t be discussed. If you have proprietary new research or R&D that is classified, all of your team members should be made aware (and firmly reminded) that all such topics are off limits. Be very specific about the words they can and can’t use. However, they may find that the knowledge they have in these areas makes a useful addition to online conversations or in discussions on professional forums. In that case, they should be clearly instructed about what issues are “fair game” for discussion, and where the boundaries are that cross into proprietary, protected or regulated information. Your team should be well briefed in the difference between presenting new facts and helpful information, and any speculation that could appear as an endorsement or recommendation around regulated topics. (Get a sample social media guidelines template here). 2. Develop written talking points. A simple document or guide that outlines to your team all the most important “themes” or areas of expertise for your company, such as focus areas or new business areas, will give your team the ammunition they need to focus where you want them to focus. You might think everyone knows what to concentrate on, but if you haven’t put pen to paper (or more likely, hands to keyboard), you can’t be sure they are all on the same page. 3. Prepare a content calendar. 4. Institute an approval process. In some industries, fly-by-the-seat-of-your-pants witty responses might win points. But in highly regulated industries, off-the-cuff remarks could end up costing you dearly. Make sure that all your content and comments are approved in advance. Create a written approval process (approval template documents help) that everyone on the team understands. Include an approval “check off” at the top of your editorial calendar or blog post templates to indicate who needs to approve it and by when. One way to ease (and speed) the approval process for new posts is to pull your social media comments and ideas from pre-approved content. Create larger pieces regularly (such as articles, case studies or white papers) with ideas that can be approved all at once. 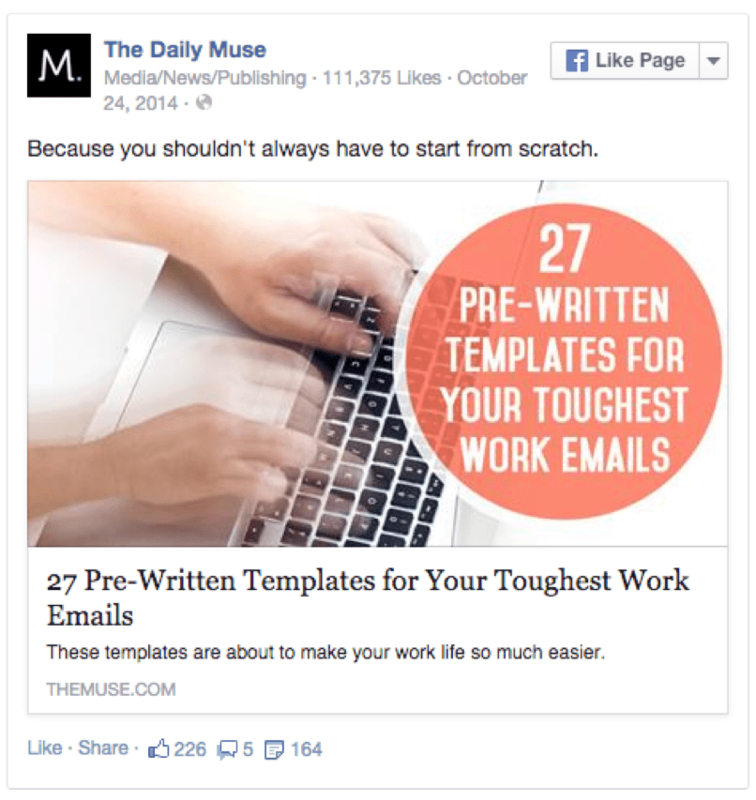 Then, pull bits and pieces of this into social media-worthy posts that let you spread your content out over several weeks. 6. Rework and reuse existing content. Similarly, you can reuse existing content by turning it into new formats without requiring a lengthy regulatory approval process. Turn a research paper presented at a conference into a series of infographics, Slideshares, or video for YouTube (have the writer or a company thought-leader read it on camera and mix in still graphics or slides with charts). Create Tweetable callout images from the key data that link to a page where people can read the entire report. Turn the presentation into an “interview” with the expert. Think about additional ways to present content that might appeal to your audience. If you need additional resources to ensure your content is appealing and also compliant, you might consider looking to outside experts. Look to outsourced resources who have experience writing for regulated industries and know the ins and outs of posting content to social media. Do you have other concerns about social media we didn’t address here? Ask us in the comments and we’ll be glad to help. Get a free template for social media guidelines here. When it comes to using Facebook for business, many people wonder what the secret for success is. 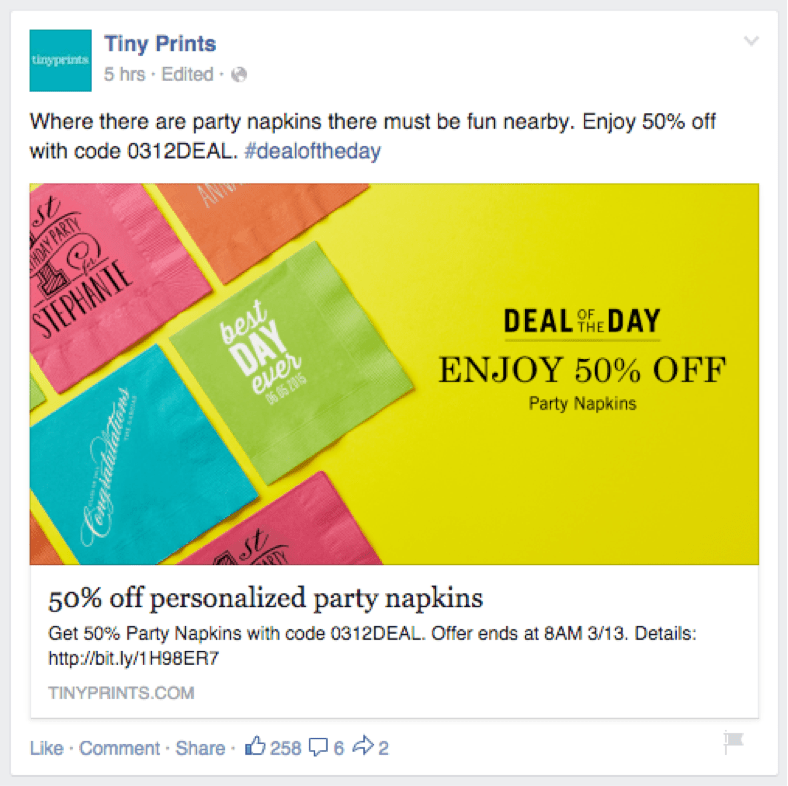 What kinds of posts get the best results, and how can you increase engagement? Are there things you should be doing that you’re not? While there is no one single right way of creating a perfect post, there are some best practices you can follow to help make your posts more successful. We’ve dissected the key elements of successful Facebook posts so you can properly optimize yours. But be warned, it’s not all kittens and dancing babies here. You’re going to have to think a little harder about what your business audience needs. 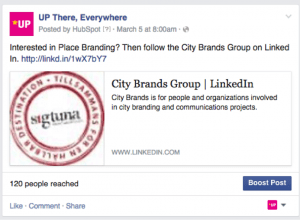 The key to a successful Facebook post is to start with a clear objective. What do you want this post to do? Drive traffic to your website? Encourage comments that build community? Get people to share it? Spark a debate? If your post has a specific objective it will be much more effective. And that objective should be obvious. Use specific language but be realistic: you can’t expect people to write an essay about how great your product is. Ask them for personal experiences, or opinions on specific situations. Remember, the goal of engagement on Facebook is primarily to build a community and create an interactive outlet of trust and sharing. A, B, or C options. Posting a statement or photo and asking people which option they agree with. (“If your coworker misses a deadline that affects your delivery, would you rather: A) pick up the slack B) call him out on it C) tell your mom). Be careful about requesting or requiring people to post something to a friend’s page. Facebook frowns on that sort of activity, which crosses a line to spamming. You may ask people to share something, but never require them to post on another person’s Wall (aka Timeline). 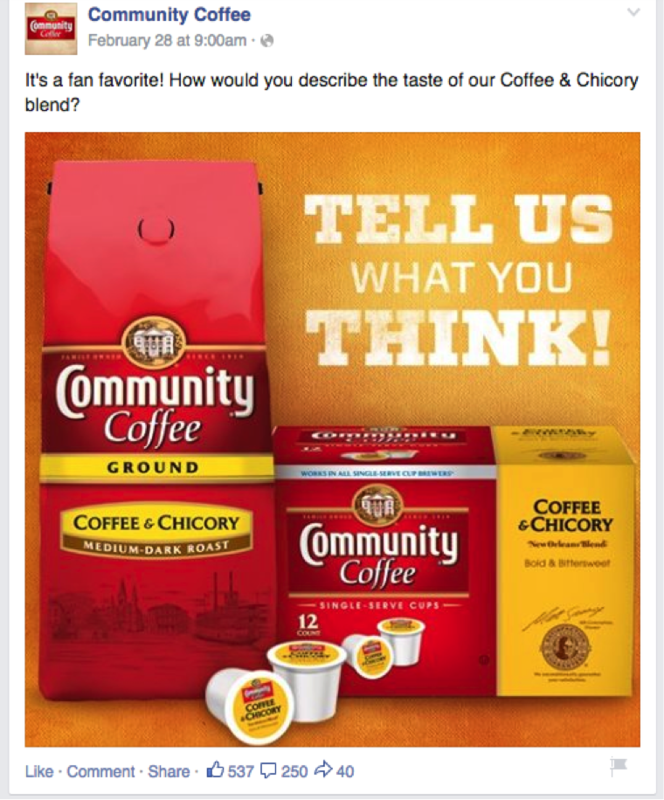 In the example below, the company asks for comments about a new product. The engagement level was high with more than 250 comments and 40 shares. If not, you might be better off creating a photo post instead with a short link. To do that, click on the photo icon in the status area, and upload a photo. Be sure to add your text and a shortened URL (use a URL shortener such as bitly or owl.ly into the photo description area. Here is an example of a photo post with shortened URL. URL links in photos (above) may be less effective than linked posts (below) in generating clicks on Facebook. 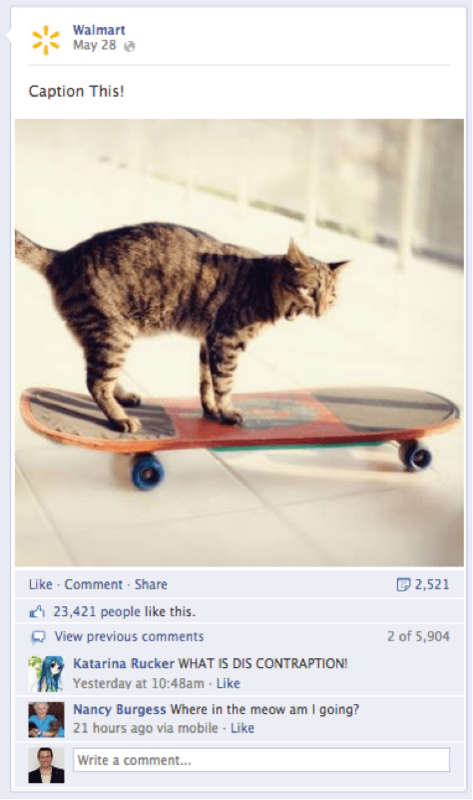 But the photo is very compelling and generated more than 190 shares, as well as over 6,000 likes. The example below is a linked post with a compelling photo. Some studies (such as this one by TrackSocial) have shown that posts with fewer characters (ranging from 40 to 70) get the best results. Use compelling yet concise language, but avoid “click-bait” phrasing. Click bait refers to using vague or misleading language such as “You’ll never believe the five things this guy said…” to generate clicks, without fulfilling the promise made by the statement. Facebook is working to penalize this practice, and it’s not a good long-term strategy for driving user engagement or lead generation. If people feel misled by your posts, they won’t come back for more. 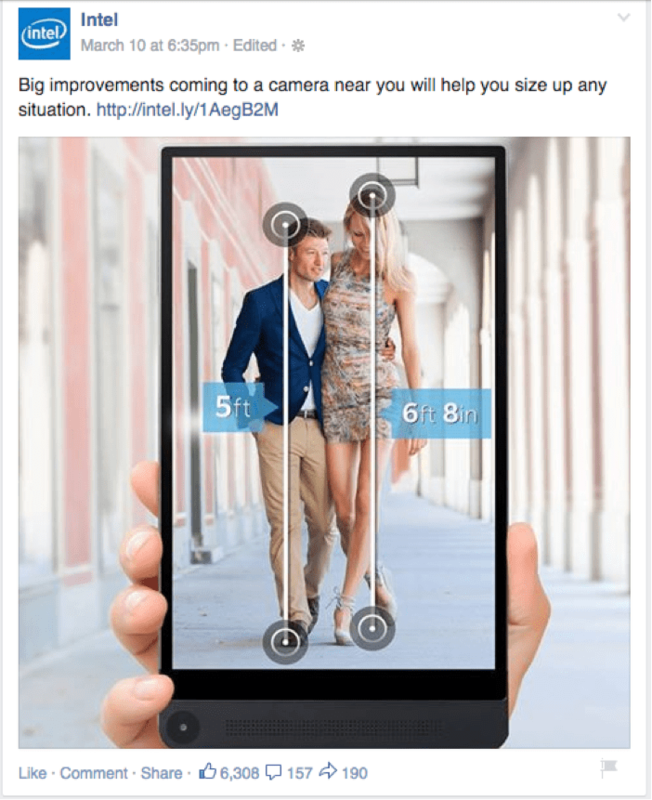 Be careful not to let your Facebook Page turn into a stream of advertising. Occasional promotions and offers are expected and effective, but you need to balance getting with giving by offering useful content to your audience and being mindful about building a sense of community. Your posts should be a near 30/70 mixture of promotional content (with links back to your website) and value-added content, in which you share relevant information that your target audience would find useful or interesting or develop the community. Occasional humor, as long as it’s not offensive and is appropriate for a business audience, is appreciated and can be very effective. You really have to know and understand your audience to make this successful (build your personas!). 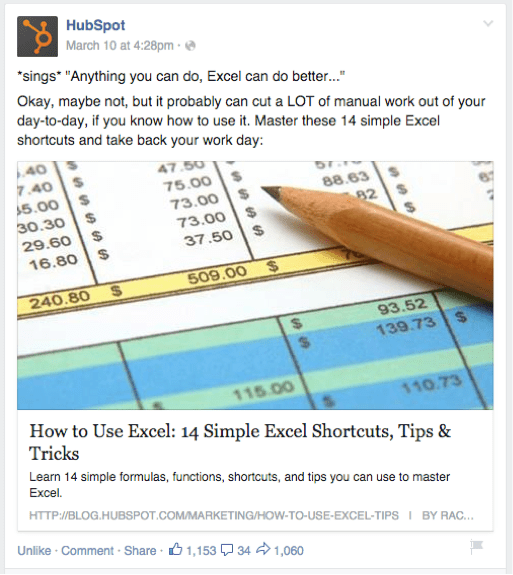 The post below from HubSpot is an example of offering valuable educational content to your audience. This post is not promotional, and not even related to HubSpot’s offering, but it has a very high level of sharing among readers (1,000 shares). People appreciate it when you share what you know—without asking anything in return. Posts that subtly (or not so subtly) tug at your audience’s inner sense of self-worth, or touch on viewpoints with which they can strongly identify, can generate a good response. Be cautious to avoid political, controversial or negative topics (unless that is the underlying goal of your Page). Positive memes and quotes that people can identify with help create a strong connection to your audience for your brand. Make sure the sentiments you post are authentic. Photos with inspirational thoughts typed into the image (as memes) are a highly effective way of getting shares. 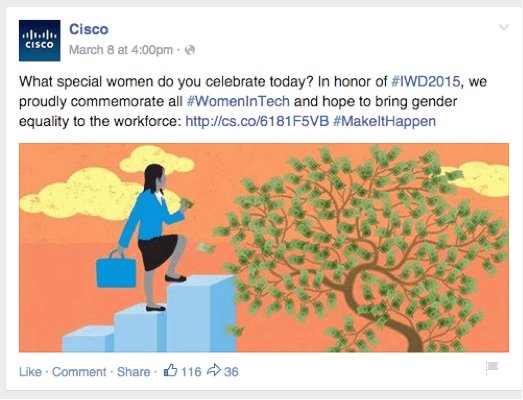 In the example below, Cisco promotes involvement with a women’s tech movement. 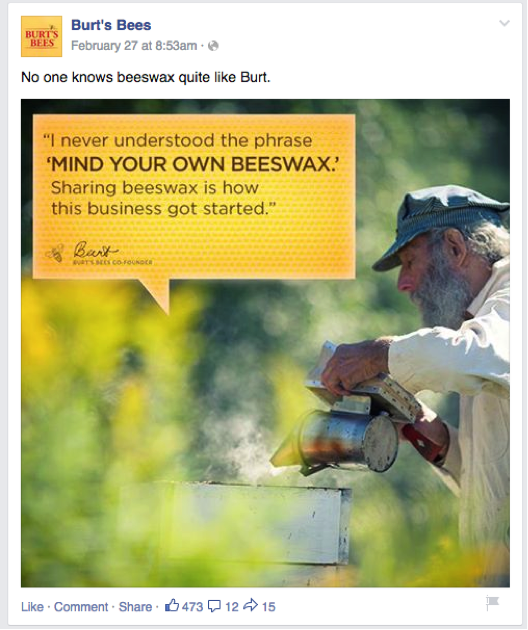 The brand-focused meme below from Burt’s Bees is both positive and shareable. In conclusion, it’s important that your posts provide an authentic representation of your brand and engage your audience in a way that shows you understand them and their needs. Be clear and direct, use photos and videos, include a call to action, and link back to your website when relevant. It’s the same advice you’ll hear from any good inbound marketer. 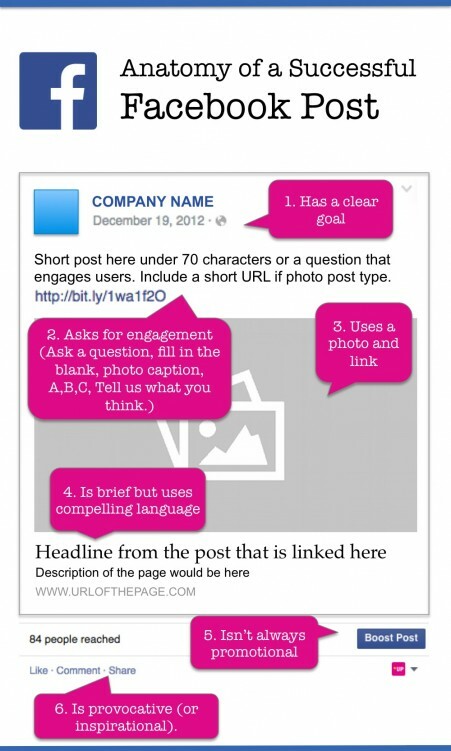 So next time you write a Facebook post, follow these 6 guidelines to be as effective as possible. Need a better way to keep track of your social media posts? Get a social media planning template here.